This elegant, distinctive home boasts 4,032 square feet of style. You’ll sleep soundly in the elegant master suite with cathedral ceilings. 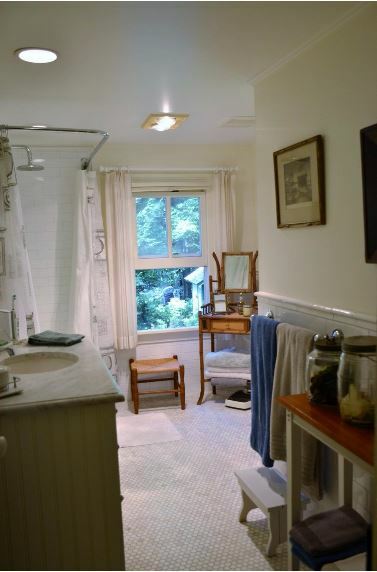 And you’ll feel a deep calm in the sleek bathroom that features a walk-in shower, relaxing tub, and floor heating. There’s no need to go to the spa! Charming and historic, this estate sits on nearly 60 acres of land in the heart of Beaverkill Valley. The rustic and unique farmhouse has recently undergone extensive renovations that include the custom-designed bathrooms, which showcase Carrara marble and Waterworks faucets! Let the day melt away in this custom-designed country estate home. Situated on 67 acres, it’s the perfect place to spend a luxurious weekend. 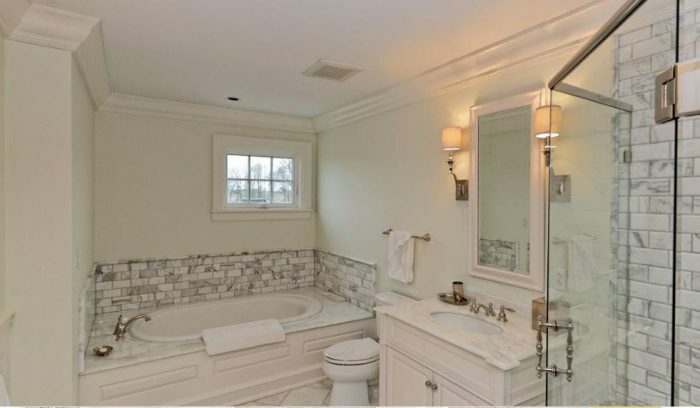 The peaceful master bathroom has radiant-heated marble floors, a jetted tub, a Roman-style shower, and designer fixtures! 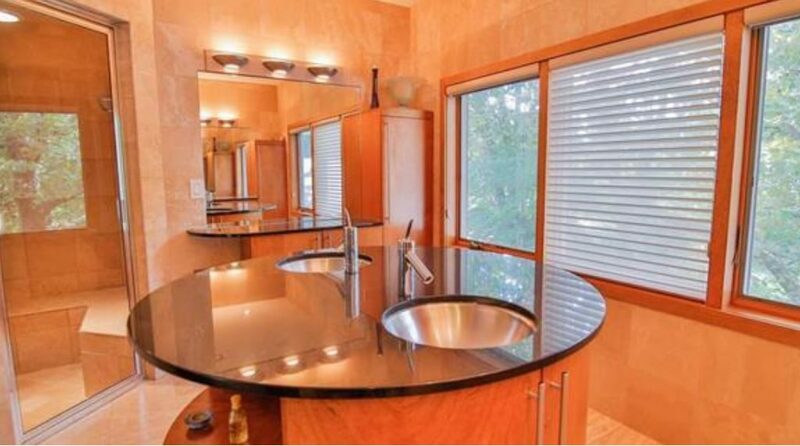 Choose tranquility with this stunning, newly renovated contemporary residence! 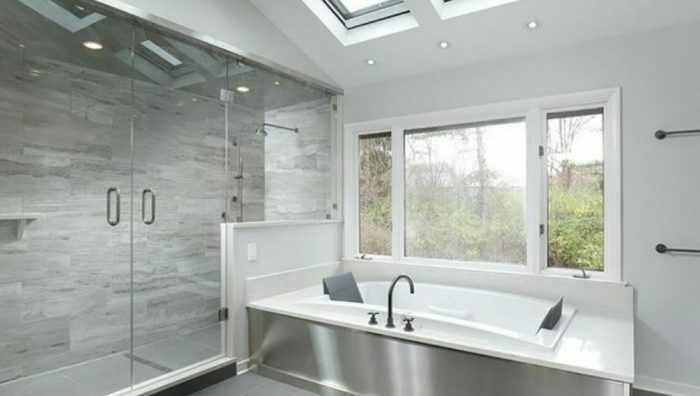 The brand new, state-of-the-art master bath will be the envy of your friends, featuring a BainUltra air jet tub with a stainless steel surround and oversized, glass-enclosed shower. Skylights fill the room with natural light. You won’t need a massage to relax if you call The Manor at Oak Haven your home! The master retreat features a generously sized bedroom, a sitting room, and a spa bath. Dual vanities, a marble shower with multiple body jets, marble flooring, and a heated towel drawer offer relaxation amid elegance. Serenity surrounds you in this architectural masterpiece. 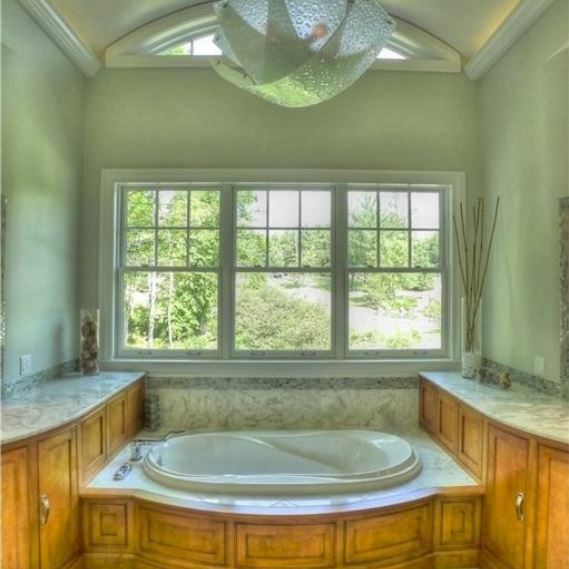 This amazing home has a spa room with a sauna, bath, and workout area, but that’s not all… It also boasts an award-winning master bath! 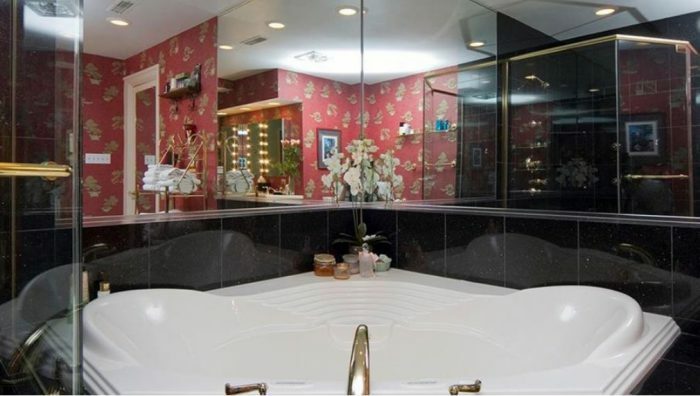 The designer bathroom has dual sinks set within a round vanity, a walk-in shower with two full body sprays, and abundant natural light. 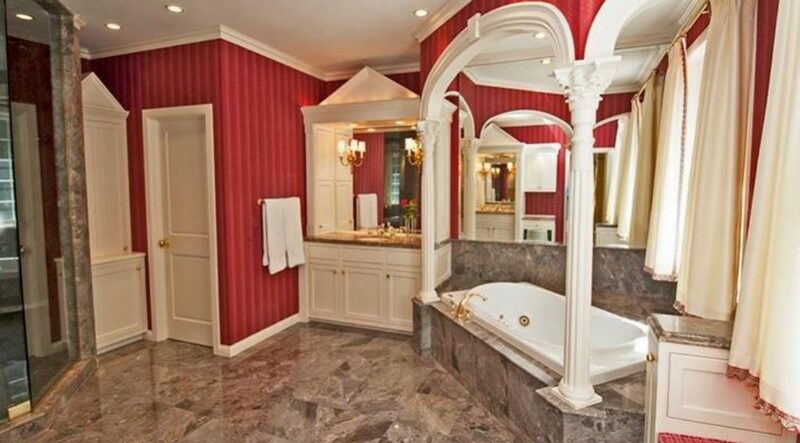 You’ll find quiet elegance in this stunning residence overlooking Crystal Lake. 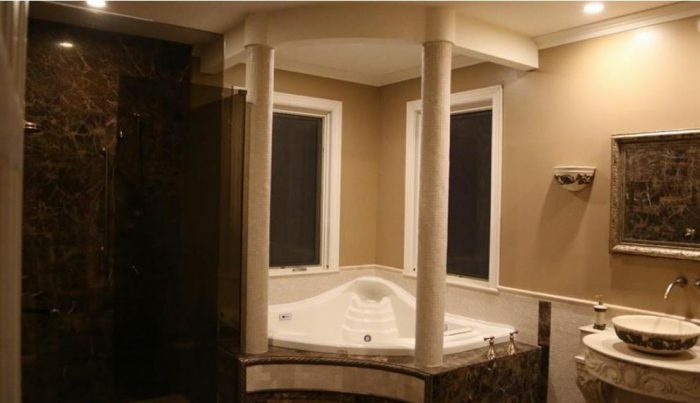 Sophisticated and meticulously constructed, this home has all the latest technology. The opulent and generously proportioned master bath offers a soaking tub and a walk-in shower with multiple showerheads and sprays. A magnificent waterfront property, this home is in one of the most exclusive communities Cheat Lake has to offer. 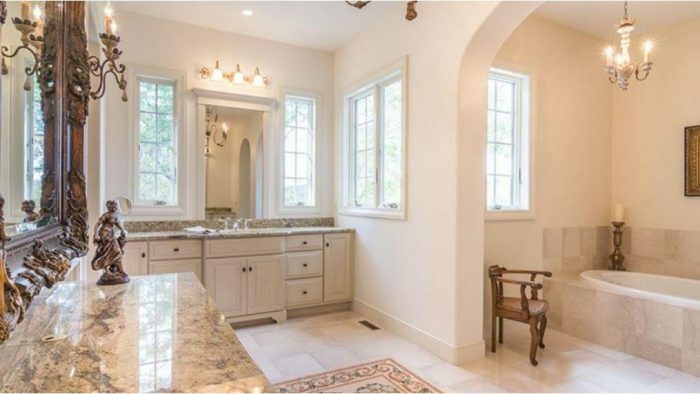 You’ll find peace and serenity in the stunning master bath with its high ceilings and double sink vanities with marble tops. Enjoy all the luxuries of elegant, flawless living! This center hall Georgian has seven bedrooms and five full bathrooms on the upper level. This home has so much to love, from the hardwood floors and crown moldings to the Florida room. You’ll fall in love with the glamour bath in the master suite with its spa tub, glass-enclosed shower, and rich appointments! This extraordinary, tranquil, and breathtaking home situated on seven acres offers every amenity! The main-level master retreat has walk-in dressing rooms and a serenely elegant marble bathroom with dual vessel sink vanities flanking a spa tub that overlooks the private surroundings. This home is a wonderful place to work and play. The magnificent turn-key thoroughbred training center is perfect for an astute investor. 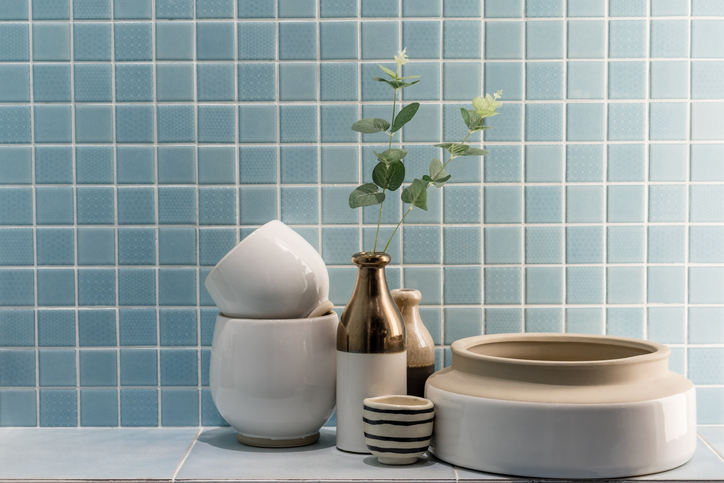 The home’s peaceful master bath, beautifully tiled in marble, will be a personal retreat where you can let the day melt away!